Welcome to the Canadian Timing Association! 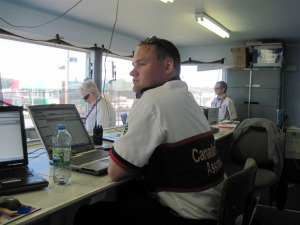 The Canadian Timing Association (CTA) is a volunteer group of dedicated racing enthusiasts who provide timing and scoring services at motor racing events throughout Ontario. 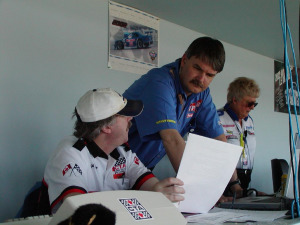 The stopwatches and hand-filled lap charts are mostly gone these days. In their place we now use computers, computer networks, and state-of-the-art radio transponder systems. This technology lets us feed instant live timing results to race officials and teams, the media, and even to the public via RACEHero web and smartphone apps. Most of our activities focus on events at our home track, Canadian Tire Motorsport Park (CTMP), also known for many decades as Mosport Park. You will find us there helping with timing services for big professional race events such as the Victoria Day Speedfest, NASCAR, and the American LeMans weekends. We also do the timing there for several CASC club race weekends as well. In addition to our contracted events at CTMP, we provide timing services for CASC clubs and various race series at the Toronto Indy, Shannonville, and Calabogie race tracks. Timing and scoring is an important part of motor racing no matter where you are! Canadian Timing Association members have front row seats to all of the racing. They enjoy free admission, food and drink at the race weekends they work, and complimentary guest passes at most events as well. We welcome new members of almost all ages. Timing and scoring is an ideal family activity for young and old alike. It is one of the few places at a race track where children as young as age 12 can play an important role in a race weekend, and hours spent volunteering with us may count towards high school community involvement volunteer hours. We provide all of the computer and systems training you'll need. You choose when you are able to come out and participate. Come out and enjoy the racing while you learn new skills! Thinking about it but need more info? Contact our Membership Director! Guest timers from other timing groups welcome too! 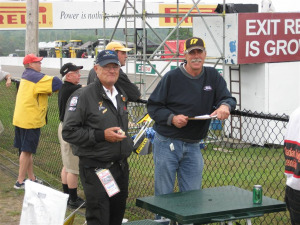 There's always room at our Mosport and Shannonville timing benches for visiting timers from other timing organizations. Experience with Mylaps is useful but not mandatory. We'll find something interesting for you to do! Please contact our Race Director and introduce yourself before the event you wish to attend. We'll answer any questions you may have and arrange your worker credentials for the event. Contracted race weekends and select special interest events for 2019. To register for an event, click on the Event Name.